Written by Lila Ench. Better World Tours. The moment I arrived on the Big Island of Hawai’i, I was greeted with a friendly ‘Aloha’ from an airline attendant. Judging from my past association with the term – I recognized that it was a customary introduction. I smiled and repeated it back to her, ‘Aloha.’ In all honesty, I did not think much of it. At that moment in time, I likened it to saying hello to a stranger. After six months of having the privilege of experiencing a truly irrepressible culture, I came to understand that the word ‘Aloha’ holds a deep rooted power that lives at the heart of the islands. A power that directly connects to the strength of the native people. To quote speaker Pono Shim, “Aloha to me is to know what’s not known. To speak what’s not said. To hear what’s not heard. To feel what cannot be felt. To touch what cannot be touched. It’s the ultimate level of sensitivity and care to what is happening.” As the United States seemingly turns more towards hatred each day, cultivating this care takes an incredible amount of mindfulness and courage. Hawaiian people have stood strong in their beliefs and values long before their island(s) became known as the 50th state. When the Hawaiian monarchy was overthrown in 1893 to ultimately become annexed by the U.S. – a kingdom was abruptly taken. A kingdom that would have remained sustainable without foreign intervention. A culture born out of respect for land, sea, and all forms of life was compromised. In the end, the spirit of Aloha was betrayed in the name of greed and that knowledge is something that is burned into the memory of Hawaiian people. That is why, when a Haole (definition: A person who is not a native Hawaiian, especially a white person) steps on to the land and is embraced with Aloha, there is no stronger act of love. Spending time on the islands and speaking with locals – I found out about things that I would have never known otherwise. Learning about deities, the importance of the Pacific Ocean, the roots of Polynesian traditions, and coming to know the strong spiritual presence in places such as Mauna Kea, Honokohau Falls and Kilauea Volcano brings a clearer understanding of the power of Hawai’i. I remember the first time I was told about Madame Pele otherwise known as pelehonuamea, an ancient goddess referred to as ‘She who shapes the land.’ Her home is at Halemaumau Crater on the Big Island. When lava starts flowing and devouring everything in it’s path, many native Hawaiians pray to Tutu Pele. Although land is destroyed in the process, there is also creation and birth. In 2018, an entirely new island was formed from the eruption of the Kilauea Volcano. Something always grows from what is left behind and everything is sacred on the islands. The word ‘sacred’ comes up a lot, because there are moments when Hawai’i truly feels like God’s playground. There is so much awe inspiring beauty that it can leave you breathless. Every sunrise and sunset feels like a miracle. Although there is so much to love, It is easy to forget that what is sacred also needs to be protected and recognize when it is being threatened. 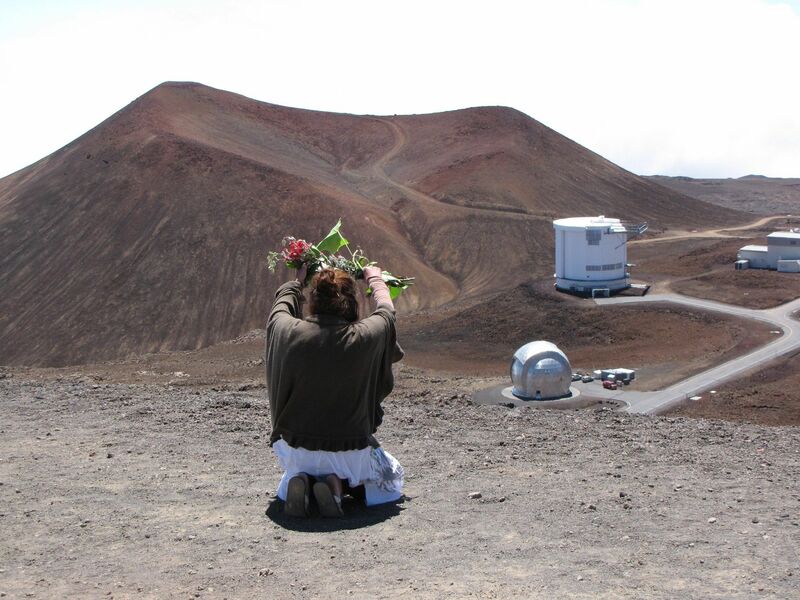 In 2014, it was announced that a thirty meter telescope was set to be built atop the Mauna Kea volcano on the Big Island. This has caused a major clash between scientific beliefs at the TMT International Observatory and the spiritual beliefs of the native people who oppose it. People from other native communities in the U.S. and beyond have come to Mauna Kea to protest the construction. To many indigenous people, building the telescope is another scar on a territory they feel belongs to them. A marking on a land by people who they feel do not respect it in its fullness and how it’s construction could negatively impact the land itself. At the root of Hawaiian culture is perseverance, courage and divinity. There is also power. Power in tradition, power in spirit, power in unity. Love in the midst of everything. That is something I will never forget. The day I left Hawai’i, I understood that aloha is much more than a word or a phrase. It is way of living, a way of being. It is something if cultivated could lead to tremendous healing in our world. I will take the things I have learned with me for the rest of my life. A – Akahai – Meaning kindness (grace); to be expressed with tenderness. L – Lokahi – Meaning unity (unbroken); to be expressed with harmony. O – ‘Olu’olu – Meaning agreeable (gentle); to be expressed with pleasantness. H – Ha’aha’a – Meaning humility (empty), to be expressed with modesty. A – Ahonui – Meaning patience (waiting for the moment), to be expressed with perseverance.